The concept of Gross National Happiness (GNH) suggests that happiness is the ultimate objective of development. The concept of GNH, rather than GNP (Gross National Product), as a development objective and philosophy was envisioned and initiated by His Majesty Jigme Singye Wangchuck, the fourth King, in the late 1980s. i. A continuous and uninterrupted culture. 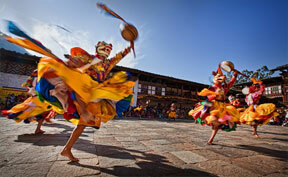 Bhutan was never conquered or colonized, resulting in a nation with a strong identity of its own. ii. A difficult terrain, which isolated it geographically and politically. iii. Vajrayana Buddhism provided a world-view upon which successive Kings of Bhutan have based their policies of developing Bhutan’s potential in every field. Gross National Happiness recognizes that there are many more dimensions to development than those associated with Gross National Product (GNP), and that development should be understood as a holistic process that seeks to maximize happiness rather than just economic growth. For the overall development of the individual and society, it is essential to achieve a sustainable balance between the economic, social, emotional, spiritual and cultural needs of the people. This has led to the declared objective of viewing development as a continuous process toward maintaining balance between the material and the spiritual needs of individuals and society. Four major thrust areas have been identified as the main pillars of GNH. These are: economic growth and development; preservation and promotion of cultural heritage; preservation and sustainable use of the environment; and good governance. Bhutan sees GNH as an alternative to the traditional economic model as it offers a more rational and humane approach to development. GNH does not regard economic growth as being unimportant, rather economic growth is seen as an important means for achieving higher ends but not as an end in itself. GNH is an integrated and systemic approach to change, with certain particular objectives, into which economic development must be consciously integrated as one component. With the world’s attention turned to Bhutan for a realistic GNH yardstick that can be used to gauge a holistic human development, the country’s only research institute, the Centre for Bhutan Studies, is developing a GNH index. The index is based on a nationwide survey that could help establish broader GNH indicators.